Noted winemaker Matt Thomson along with investors including London-based wine importer David Gleave purchased the Delta Vineyard site in 2000. Delta Vineyard is located to the west of Bleinheim in Marlborough, and was planted to Pinot Noir in 2001 and 2002. 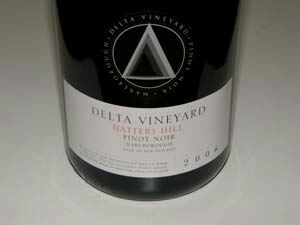 The Delta Vineyard label makes up two thirds of production, with the best fruit from the highest elevations of the vineyard going into the top tier Hatter's Hill label. Imported to the United States by Vintus Wines, Pleasantville, NY.